If you don’t know how exactly to stand out in order to present yourself in the most extravagant way, there’s one easy method that will surely help you achieve this goal almost effortlessly – a hairstyle change. There’re so many hairstyles women may choose from, each having its unique history and message that your head starts swimming. It’s just the matter of taste. But if you don’t know what hairstyle to choose, and you’re not afraid of changing your hairstyle drastically, then you are welcome to try any of the mohawk styles. Mohawk Hairstyles for Black Women: What Does This Hairstyle Mean? Mohawk hairstyles are one of the most popular hairstyles among African American women. It took its name from the Native Americans, called ‘Kanienkehaka’, who got their ‘Mohawk’ (‘man-eaters’) name from their enemies due to the type of haircut of the former: men used to shave hair only on the sides, leaving a hair strip down the center of their heads. The modern Mohawk version and its variations are much of the same pattern. Today, it’s a unique hairstyle that sends a powerful message to the world, and there’re so many different techniques and styles in which you can get a Mohawk. But what does this type of hairstyle mean? The Mohawk itself is not just beautiful, but rather breathtaking, and it was designed for true fighters. It’s a very powerful stand out, especially for starters, but if you want to show your confidence, decisiveness and independency, then Mohawk styles are exactly what you need. Could you ever imagine that mohawk hairstyles for black women mean that much? Wondering how a modern Mohawk hairstyle looks like and how it can be stylized? Let’s take a deeper look! African American mohawk hairstyles: not commonly associated with Afro-American hairstyles earlier, Mohawk is becoming more and more popular among African Americans. Taking into account that African American hair has a different texture (extra textured hair), it has to be cut and picked in a way that would keep the Mohawk shaped in a right way. Faux-Hawk Hairstyle (Halle Berry, Rihanna, Pink, Willow Smith). The most common and popular type of Mohawk. The hair has to be 3-4 inches long to be molded together in order to form a spiky fan look, with the sides either shaved off or not. It’s the common hairstyle of the British football superstar David Beckham. Dreadhawk Hairstyle. Dreadhawk requires the hair to be very long, because it needs to be either matted coiled or dreadlocked and tied like a ponytail. The front part of the head and the sides are shaved. Fanhawk Hairstyle. It’s a pointy strands hairstyle with the hair molded into strands, either concentrated on a certain spot or spread out, that point upwards. 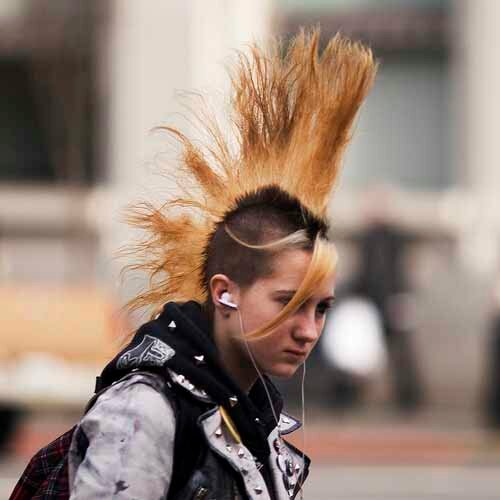 Due to the style’s rebel-like look, it’s the most common hairstyle of punk and rock stars. Rayhawk Hairstyle. This is a not very popular Mohawk hairstyle, according to which the middle part of the hair, which, if compared to the sides of the head, is relatively longer, is shaved. Liberty-spike Hairstyle. Though this Mohawk style is the most unique out of the all abovementioned styled, it requires a lot of maintenance. Besides, unlike the Fanhawk, it needs the spikes to be both very long and strong enough. Previous post: What Medium Haircuts for Fine Hair Will Make You Look Fantastic?